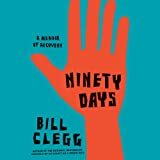 Ninety Days is a follow up to Clegg's story of his descent into drug use and his final entry into drug rehabilitation. He moves back to Manhattan and struggles to maintain 90 days of sobriety with the help of friends and Alcoholics Anonymous. It really is a struggle, and Clegg goes through many relapses in the process. Not only that, but his friends also have similar problems, and this causes him extra stress and places him at greater risk. Clegg used to earn a lot of money in the media industry, and he used to have a boyfriend. He led an expensive wasteful life but he made a lot of money. Now he has far less income, and this is one reason why he finds it difficult to do drugs any more: he just can't afford it. Yet he does occasionally find a way to get the money and this causes more problems when it was meant to be used to pay the rent or for other debts. Yet in some ways Clegg's life is still privileged; he has wealthy friends and while his family was very dysfunctional, they are also there for him in some ways. It is striking how he distinguishes himself from the rich kids. This memoir is likely to provoke strong emotions as the story moves along. Those emotions are likely to vary depending on the reader's own experience. Some will feel great empathy for his pain and how difficult it is for him to overcome his self-defeating behavior, and glad for him that he gets comradeship and companionship in his AA meetings. Others are likely to feel intense anger and frustration each time he relapses, hurting himself and putting others at risk too. Memoirs of these kinds of journeys are quite possibly a record of a disease, but they are also profoundly moral, telling of both concern for others, guilt, and an occasional callous readiness to completely forget about the effects on others. It's this last part that is especially hard to listen to, and it creates a tension in working out how to react, and how much anger to feel on behalf of those that Clegg lets down. This memoir is good at giving a vivid sense of what it is like to keep on going to AA and how it might be useful in overcoming a drug or alcohol problem. The unabridged audiobook is performed by Clegg himself, and this adds to the emotional weight of the listening experience. Clegg is a good reader, with clear diction, a consistent tone, and a wide emotional range.